Sometimes artefacts come into our collection and we simply cannot explain how they got there. Not in the sense that no-one can remember how the artefact was acquired, but more in the sense that we cannot find that link between the artefact and the place it was found. One of the ways that we acquire artefacts is through purchases from local dealers; it’s amazing what you can find hidden in small antique shops around Ontario and Quebec, and this particular artefact was one of them. 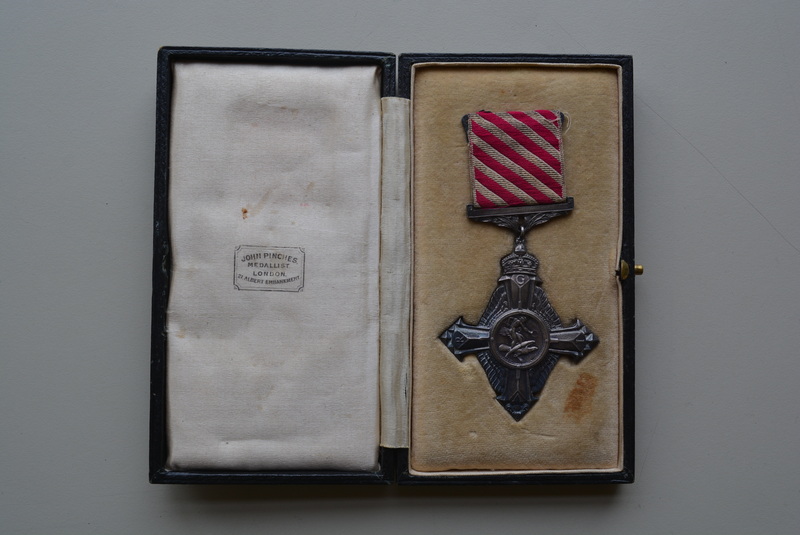 The Air Force Cross was awarded for “”an act or acts of valour, courage or devotion to duty whilst flying, though not in active operations against the enemy” and was first introduced with the founding of the RAF in June 1918. This particular cross arrived in its original box from an antique shop in rural Ontario, accompanied by a handwritten note detailing that it had belonged to one Rennie Thomas, which led me to believe that the man’s name was in fact Rennie Thomas and not Thomas Rennie. Searching through the records for the RAF I was able to establish the correct name as Leo Thomas Rennie and that Rennie had been transferred to the RAF in the spring of 1918, shortly after its founding, but nothing about Rennie’s origins beyond that. Normally, if a medal ends up in an antique shop in Canada, one would assume that the original owner was also probably Canadian, or had family in Canada, but after searching LAC’s database of World War I soldiers I could not find anyone who matched the name. Canada did not have its own air force during the First World War, and those who wanted to fly had to transfer into the RFC or later the RAF. The Canadian records therefore stop upon their transferral and researchers must go from there to the National Archives in the UK to continue to trace the war time careers of the Canadian men who joined the air force. By going back to the National Archives I was able to establish that Leo Thomas Rennie was not Canadian at all, but was born in Lancashire in 1893 and enlisted with the Army Ordnance Corps in 1915 as a private. He transferred to the RAF in August 1918 and was trained in Egypt and Palestine before being sent to the Western Front in October 1918. From there, Rennie was stationed in Fermoy, Ireland until he was discharged in February 1919. His Air Force Cross was gazetted on 10 October 1919, eight months after he had left the RAF. Though we now know quite a bit about Rennie, the problem of how his Cross came to be in a small antique store in rural Ontario still remains. A cursory search of landing documents after the war does not show Rennie landing in Canada between 1920 and 1935; trying to dig deeper will take much more time and some lucky breaks. Sufficed to say that Leo Thomas Rennie’s medal travelled almost as far abroad as he did! Will do. Over and out.